At Greater Tacoma Community Foundation, we recognize there is no single solution for the diversity of philanthropic goals our donors and community organizations have. It is our job to tailor solutions to meet our donors’ needs. Many of our donors feel their involvement with GTCF has leveraged their giving and strengthened their connection to our community. How can we be of assistance to you? Please contact a member of the Donor Services team, at donorservices@gtcf.org or 253.383.5622. Bill and Peggy Barton aren’t new to our community. In fact, they have made their lives here. Bill was an engineer and business planner at the Weyerhaeuser Company and Peggy taught Spanish in Tacoma Public Schools. Here they raised their son and daughter, and have been members of Mason United Methodist for more than fifty years. They are long-time supporters of local music groups including the Tacoma Symphony, Tacoma Opera, Tacoma Concert Band and the Northwest Sinfonietta. In addition, they have volunteered with the Tacoma-Pierce County Genealogical Society, Master Gardeners of Pierce County, Tacoma Youth Symphony, Washington State History Museum, and FISH Food Banks of Pierce County (including the location in their church!). They are likely to remain fixtures in our community for quite some time to come. When Bill retired and he and Peggy looked at their investment portfolio, they realized how fortunate they had been and decided at once: “We have to share it!” They generously split their estate into three: one-third for their son, one-third for their daughter, and one-third for the community. Bill approached the Greater Tacoma Community Foundation in the early 1990s with interest in learning how this three-way split might be implemented. He was given the recommendation to consider a Charitable Gift Annuity (CGA). Dodie Shelton “saw life in colors,” her son Steve recently recalled. Our community is grateful that she did. 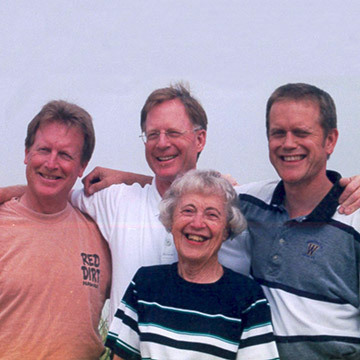 In her honor, Steve and his brothers, Scott and Stuart, endowed the Dodie Shelton Art Scholarship. Anyone who knew Dodie knew she had three great passions: family, art, and community. She was a graduate of Stadium High School, Class of ’38, and went on to study art at San Jose State University. There she met her husband, Toney, and together they returned to Tacoma where she began teaching art at Grey Junior High School, and started her own prolific career as an artist. Toney, on the other hand, served as the Business Manager for the Tacoma School District for 27 years! Dodie’s commitment to family and art was matched only by her dedication to the Tacoma community. She was the President of the Pacific Gallery Artists and volunteered with so many other organizations that her sons strained to remember them all: the Garden Club, American Cancer Society, Metro Parks Tacoma, Washington Historical Museum, and she helped found Tacoma’s first co-op preschool, Mason Methodist Co-op (now Jack and Jill Co-op). “She saw a need and worked toward filling it,” Steve said. Bill and Nancy Smith spent more than 30 years bringing joy to children around the world by providing toys and novelties from their Sumner-based company, Toysmith. Bill started the company in 1981 from his garage, and when they handed over the reins to new leadership, Toysmith stocked and shipped more than 1,600 products to more than 7,500 retailers around the world. Focused on building Toysmith for so many years, the Smiths had little time to dedicate to personal interests in their own backyard. But with the sale of their company resulting in greater liquidity and more time, they decided it was time to build again – this time with a philanthropic focus on their community. The Smiths’ first step was to turn to their strong team of advisors, including their attorney, accountant and financial advisor. To enable the Smith’s desire to give to the community, Jun Chea, their financial advisor at KeyBank, helped to structure a charitable lead annuity trust (CLAT) with a donor advised fund through GTCF. The vehicle is a good fit for the Smiths – it allows them flexibility in their giving, a requirement for the couple who did not yet know how their philanthropy would take shape, and offers tax efficiencies. When GTCF first met the Smiths, they identified three areas of interests: education, sports and healthcare. As Nancy described, the bottom line is “we want to have an impact at the grassroots level by helping to identify someone in need and get them the support they need in order to see an impact right away.” Given the Smiths’ parameters, “we set out to identify investments they could see and feel,” says GTCF’s Director of Donor Services, Sherrana Kildun. GTCF began by focusing on the education component and contacted the superintendent of schools in Cle Elum, where the Smiths have a second home and feel a strong connection to the community. “In our conversation, we explored opportunities and learned about pressing gaps for students who don’t follow a traditional college-bound path,” Kildun said. “As a result, we proposed a scholarship program to support Cle Elum-Roslyn High School graduates who express interest in furthering their education at a technical or community college.” The Smiths were thrilled to learn about this specific need and the opportunity to provide support! Together, GTCF and the Smiths worked to shape the scholarship program in a way that best serves the students, including covering full tuition and fees throughout the duration of the two-year program. “Giving out our first scholarship was such an emotional experience for Bill and I as we saw the student’s dream become a reality,” Nancy explained. The Smiths are extremely humble and excited about learning all the opportunities available to them as they embark on this new philanthropic path. 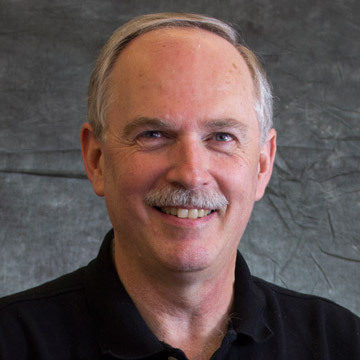 “Providing educational opportunities is very important to us,” Bill explained. “We are looking forward to doing even more with GTCF, and discovering more opportunities to become involved,” Nancy added. 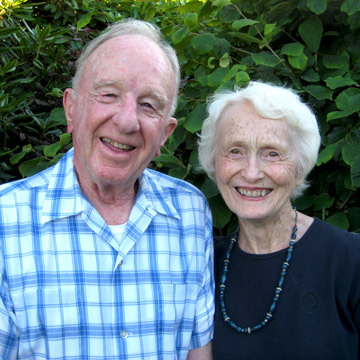 Enid and James “Jim” Harris are members of GTCF’s Legacy Society. Individuals and families who, through their estate plans, have established a planned gift of any size to GTCF are recognized and honored through our Legacy Society for their support of our community and its future. “For 57 years, we’ve been partners. Whatever one of us has decided to do, the other one is right there supporting,” shares Enid. 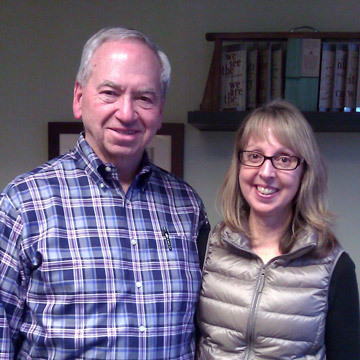 Jim, an architect, and Enid, a teacher, immediately began to immerse themselves in the community and church. “We just jumped in with both feet,” describes Jim. Fifty-six years later and still brimming with optimism, Enid and Jim are deeply rooted in the community and well-known for their professional and personal contributions to the region. In 1960, they started their own architecture firm out of their home. Working side-by-side, they successfully grew their business. The firm’s designs include the Reflective Glass Building and the Telco Building on Broadway, KBTC TV station on 19th, and the South Campus of Bates Technical College. Passionate about art, Enid and Jim were early pioneers of the Tacoma Art League, which became the Tacoma Art Museum (TAM). Jim spent weekends hanging shows in the small Broadway store that the League occupied while Enid helped host opening receptions. They later helped hire the first TAM director and launch the successful “Night Tacoma Danced” fundraiser. 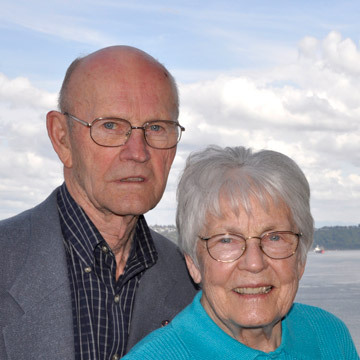 Among their many other community endeavors, Enid and Jim helped organize Point Defiance Zoo & Aquarium’s inaugural ZOOBILEE and traveled with Mayor Vialle’s initial group to Vladivostok, Russia to form a sister city with Tacoma. Jim served as president of the Downtown Tacoma Association and was founding co-chair of the Downtown Revitalization Task Force. Both are Rotarians. Jim has served as President of Tacoma Rotary 8 and District Governor while Enid has been instrumental in advancing its literacy programs. They’ve journeyed with Rotary International to Vietnam, Russia, Mexico and Ethiopia, delivering medical and education resources. Travel is one of their passions. To date, they’ve visited 56 countries, circumnavigating the world twice. “Over the years, we’ve been impressed with the work and management of the Community Foundation with our small, donor-advised fund. In our estate planning, we felt comfortable entrusting the Community Foundation.” Throughout their lives, Enid and Jim have worked to impart in their children, grandchildren, and great–grandchildren, “What you can accomplish is unlimited, as long as you don’t care who gets the credit.” Their own lives are a true testament to that. My client spent his entire career at Boeing. Now, battling formidable health challenges, he is embracing the final phase of a long and meaningful life. As has always been his custom, his thoughts go to others. In a recent conversation, we spoke of how important it is for him to help organizations that have been dear to him and those that were close to his deceased wife. As we continued to explore how he could benefit these organizations, I saw a twinkle in the eyes of someone who had lost his sight but not his vision. When I suggested that he meet with the Greater Tacoma Community Foundation, he quickly agreed. Due to his physical limitations, GTCF’s team went to him, and over the course of several weeks we worked together to create a planned gift that would meet my client’s needs and benefit the community for many (many) years to come. As a professional advisor, the Greater Tacoma Community Foundation allows me to connect clients’ dreams with creative solutions to make a difference in our community. Whether the challenge is selecting beneficiaries that fit a client’s particular passion or structuring their gifts, GTCF has enabled my clients, regardless of budget, to leave a legacy of generosity. Story after story, year after year, the Greater Tacoma Community Foundation helps to make my job as a professional advisor meaningful and rewarding.